BETHESDA, MD – The Villages is the top-selling master-planned community (MPC) in the U.S., based on total new homes sold in 2003, according to Robert Charles Lesser & Co., LLC, a leading independent real estate advisory firm. After topping the list for six consecutive years, Summerlin in Las Vegas has finally yielded its number one position to the Florida community located between Orlando and Ocala. The Villages is an active adult community which markets to individuals 55 years of age and older. With 21,800 total acres, the developers do not expect to complete build-out until 2013. Master-planned communities are large-scale developments featuring a wide range of housing prices and styles, an array of amenities and multiple non-residential land uses (such as commercial, hotels and educational facilities) offering residents an attractive and convenient environment to live, work and play. These communities may provide lifestyle options for multiple market segments, or target a specific buyer type. Each year, RCLCo invites communities across the U.S. with gross sales of 300 homes or more to participate in the annual survey. To compile the list, RCLCo examines historical rankings as well as new sales information. The Top 20 MPC developers verified the list. 2000 was the first year a significant number of master-planned communities sold over 700 homes, which motivated the firm to enlarge its annual list to 15 communities, up from its traditional top ten. Communities with home sales of 1,000 plus dominate this year’s top 20 announcement. Fully 25 communities reported sales of over 700 homes – a remarkable number. All but two of the respondents met or exceeded their sales goals for 2003. The Del Webb Corporation continues to have the largest number of communities on the list (five), including four of the top five master-planned communities targeting active adult buyers. Its Sun City Palm Desert community sold out in 2003. What is the formula for success? Most of these communities are in areas that are continuing to experience rapid population growth despite a slow economic recovery, steady if not strong employment growth, abundant housing options appealing to wide range of consumers and large tracts of available land in desirable climates. Another significant factor is a higher than normal exodus of renters turning to homeownership due to low mortgage rates. New and resale homes continue to maintain a hot sales pace despite a weak stock market. 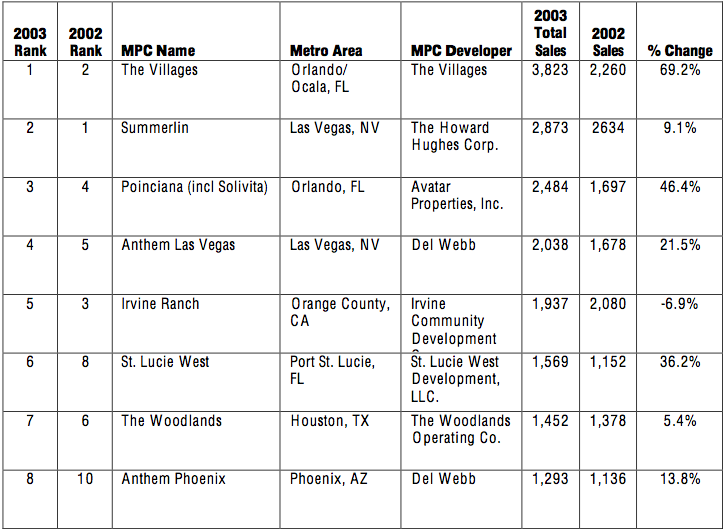 Leading by example, sales at the top ten Master-planned communities in the country were up an average of nearly 20%.